EM rout? Or Intervention Sunday? Morgan Stanley warns of a possible “suddEM stop” for one or more economies, a play on the abbreviation for emerging markets. But even if you are sure that is going to happen, forecasting the timing is far from easy. What puzzles me is that these risks have always been in place. So why is the market so worried now? Is this the start of a full-fledged panic? Indeed, one of the two tripwires outlined in my recent post (see The EM line the sand) has been tripped. The relative performance of EM bond ETF (EMB) to US junk (HYG), which is a junk vs. junk measure of market appetite for EM assets, has violated a key relative support level. In fact, this relative return ratio is now back to the levels set in the panic lows of the Lehman Crisis. However, my other indicator of EM risk appetite, the performance of EM currencies (CEW), is still testing a support zone. For now, that market confidence measure is still holding - so far. Meanwhile, global equity prices have been spooked as European and US stock indices closed lower for the week. Official intervention was largely ineffective. As an example, Turkey's surprise hike of interest rates was able to turn the market around for only a few hours. The current environment suggests a high degree of volatility ahead for all asset prices. On one hand, the bulls should be aware of the possibility of an emerging market currency crisis is very real and we could see a real rout in asset prices starting with EM assets. On the other hand, the markets are setting up the pre-conditions for massive intervention. The possibility of an Intervention Sunday, where a coordinated effort by G7 central banks to stabilize markets, should be in the back of the mind of every bear. In the past week, I have seen commentary from various technical analysts indicating that gold stocks appeared to have bottomed and poised to rally. I took a look and concurred with the assessment. However, I feel slightly uneasy about going long gold stocks at this stage despite the positive technical backdrop because this group tends to be slightly negatively correlated to the stock market and the major averages have fallen very fast and very quickly in a very short time. The above chart of this pair (XME vs. GDX) shows that metal and mining stocks relative to gold stocks. With the exception of a brief period last August, XME has been in a steady relative uptrend since late 2012. Now that GDX has staged a relative rally, this relationship has settled back to the bottom of the range, this may be a fairly low-risk entry point for the long XME/short GDX trade. Needless to say, if you were to put on such a trade, keep a tight stop in case gold stocks continue their relative rally. Back in July, I wrote that the key risk to a Fed taper was a rising risk premium and the health of emerging market economies was a key indicator of how the market might re-price risk (see It's the risk premium, stupid!). 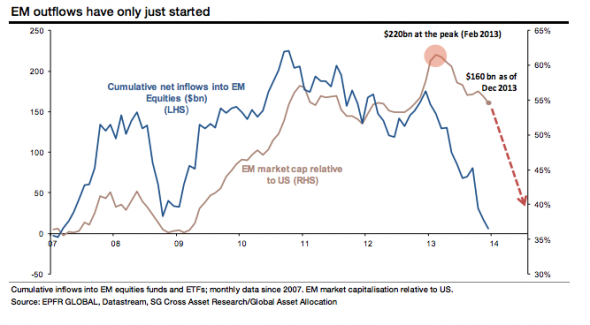 Now the blogosphere has been buzzing about how a continuing Fed taper might sideswipe emerging markets. While it's nice to be ahead of the curve, it seems that the problems currently faced by selected EM currencies are due to local conditions, e.g. the problems in Argentina are unrelated to the problems in Turkey, and the risk of a global EM currency crisis sparked by Fed tapering is well under control. During the emerging markets crisis of 1997, the S+P 500 rose 31.0% that year with only one brief correction amounting to 9.6% early that year. There was a more significant correction of 19.3% in 1998 after the Russian ruble crisis and mostly in reaction to the collapse of LTCM. Yet the S+P 500 rose 26.7% that year. History doesn’t repeat itself, but it does rhyme. The notion that an emerging markets crisis is bearish for the US stock market isn’t confirmed by the experience of 1997. Recessions are bearish for stocks. So far, it’s hard to see how the current emerging markets crisis triggers a recession in the US. In emerging market economies, increased financial market and capital flow volatility remain a concern given that the Fed will start tapering in early 2014. The responses to the related December announcement have been relatively muted in most economies, possibly helped by the Fed’s policy communication and re-calibration (including revisions to forward guidance). Nevertheless, portfolio shifts and some capital outflows are likely with Fed tapering. When combined with domestic weaknesses, the result could be sharper capital outflows and exchange rate adjustments. For investors who believe in the Fed tapering risk thesis, here are two key indicators to monitor especially as global markets wait for the results of the January FOMC decision and statement. First of all, watch the relative performance of the EM bond ETF (EMB) against US junk bonds (HYG) as a measure of risk appetite in EM (EM junk vs. US junk). Despite all the hoopla about EM economies are tanking, the EMB/HYG ratio has tested and held a key relative support level. Second, watch how currency ETF (CEW) to see how they react to the Fed decision. CEW is also testing a key technical support level and support has held, so far. As I write these words, Turkey's made a surprise decision to hike overnight rates from 7.5% to 12%, which was much higher than Street expectations of 10%, and we are seeing a risk-on rally. Nevertheless, these are two key indicators of whether EM economies may have caught Taperitis. Bloomberg Briefs hosted a must-read debate for investors between Michael Pettis and Eswar Prasad about the outlook for China. Regular readers of this blog will be familiar to the work of Michael Pettis, to which I mainly subscribe. To paraphrase Pettis, he believes that China's growth strategy of credit driven export and infrastructure based growth, which depends on financial repression for cheap capital, is reaching an era of increasingly diminishing returns. In the wake of the global financial crisis of 2008, China embarked on a round hyper credit fueled infrastructure growth which created an enormous credit and property bubble. Beijing recognizes the risks and has begun to re-focus the source of growth toward the domestic consumer. Pettis believes that this transformation will move the Chinese economy towards a much slower growth rate over the next decade. Prasad, by contrast, thinks that China can maintain growth at current levels. His conclusion is based on the observation that the Chinese leadership is doing all the right things to transform and reform the economy. China's leadership has faced growth scares before and they have a history of adroitly managing the situation before. The naysayers are wrong and there will be no crisis or any dramatic slowdown. I believe that Prasad's arguments make sense, were it not for the risks posed by this enormous mountain of debt built up to finance unproductive bridges to nowhere. I had a conversation with a importer friend, ""what is the condition of those manufacturer in mainline?"" His answer was revealing, the more contracts accepted, the more they lose. But, they are willing to accept more contracts, in order to get more loans. The loan would be used in speculative activities. In 2012, June, we heard there was a cash crunch, seems, the frequencies of rumors are rising. I don't know this respondent personally so I cannot vouch for the veracity of the remarks. However, if these comments are correct, then it indicates that financial excesses are building up quickly and the authorities are taking steps to curb speculation. We are likely in the late innings of this metaphorical baseball game. Goldman Sachs Group Inc. Chief Economist Andrew Tilton wrote in a Jan. 22 report that trusts are similar to structured investment vehicles prominent in the 2008 crisis in their “linkages with banks, the off-balance-sheet nature of the trusts” and the long-term projects funded by short-dated funds. Goldman estimates the 2 trillion yuan in lending by trusts last year accounted for 10 percent of financing in the economy and a removal of credit flows from trusts would knock 0.8 of a percentage point off the nation’s growth rate. Gross domestic product will expand 7.45 percent this year, the slowest since 1990, a Bloomberg survey of economists signals. The first default of a trust product in at least a decade would shake investors’ faith in their implicit guarantees and spur outflows that may trigger a “credit crunch,” according to David Cui, China strategist at Bank of America Merrill Lynch in Hong Kong. The government and state banks may bail out a significant portion of bad debt “to prevent a financial crisis,” he said. Guangdong International Trust + Investment Corp. failed to pay Yankee notes in 1998, the nation’s first default since the People’s Republic of China’s founding in 1949. Stresses are starting to show up in the financial markets. The relative performance of Dim Sum bonds to US Treasuries have keeled over, though they remain in a relative uptrend indicating that a risk-on environment is still in effect. As we approach January 31 next week, this relative return ratio will represent a key test of the market's perception of the stress levels in China's financial system. Similarly, my so-called Chinese canaries, or Mainland banks listed in HK, are starting to weaken. The price performance of state-owned banks continue to be healthy, though the performance of smaller and mid-sized banks (red line) have weakened more than the state-owned banks. Readings are not at panic levels as the index of smaller banks have not even declined to the initial support zone, represented by the lows reached during the 2011 eurozone crisis and the index is far above the crisis level lows set during the height of the Lehman Crisis in 2008. "They are trying to deleverage without blowing the whole thing up," said CITIC's Zhang Yichen. "The M2 money supply is 120 trillion RMB but that is still not enough cash because velocity of money is very slow, and interest rates are going up." "My guess is that they will manage it. The US couldn't contain Lehman contagion but in China all contracts can be renegotiated, so it is very hard to have a domino effect. We'll see a slow deflating of the bubble," he said. In the west, we do business with the mentality of ‘I trust you until I don’t because I have a legal system where I can get you if you do something against what we agreed to’. In China, you start off with complete distrust and then you build trust on top of that. So, the person across the table is thinking the same way. If you offer them a fair deal, they’re going to think you’re screwing them and that they have to dial back that deal. You don’t offer someone a fair deal. You offer them an outrageous deal because then you can dial it back to be a fair deal. ICBC and China Credit Trust may each take responsibility for 25 percent of the product’s payments, while the Shanxi government may assume the rest, Guangzhou-based Time-Weekly reported yesterday. Shanxi government denied it would take a 50 percent responsibility in a report on its website yesterday. ICBC Chairman Jiang Jianqing told CNBC in Davos, Switzerland, that the lender won’t “rigidly” pay out on the trust and the incident will be a lesson on risk for investors and a chance to educate trust companies and his own bank. Should Beijing decide on a policy of backdoor bailouts, then it would take the tail-risk of a financial crash off the table in exchange for the re-emergence of financial repression of the household sector, which would consequently lead to a prolonged period of slow growth. It could mean a Lost Decade in China where the speed limit to growth is not more than 3-4%. If my hypothesis is correct, then Bejing may indeed losing its nerve, probably in the name of the ultimate goal of preserving social stability. Under such a scenario, it creates a good news-bad news situation for China and the course of global growth. The good news is China is unlikely to crash. Reforms are likely to occur in fits and starts and China will go through reform-stimulus and bailout cycles. Under these circumstances, developments such as the disappointing the January HSBC flash PMI should be viewed by traders as buying opportunities. The bad news is that China's economy would pay the price in a prolonged period of much slower growth than it had experienced in the past two decades. Investors should be disappointed as the longer term growth path would be much lower than what the market expects. Are stocks tumbling too far too fast? I know that I had said that the week after option expiry tends to have a negative bias and I expected some stock market weakness last week (see A minor pullback, then...), but the pullbacks on Thursday and Friday were sudden ans swift. By mid-day Friday, my trend following models, which are always late by design but intended to spot longer dated market moves, were flashing urgent caution signals. A review of the short and intermediate term indicators this weekend, however, suggest that equity markets are due to stage an oversold rally next week. First of all, the term structure of the "fear curve" is flashing an oversold signal. The chart below shows the VIX/VXV ratio shows that the term structure of the VIX has inverted. On Friday, we saw an inversion as VIX close higher than three-month volatility (VXV). 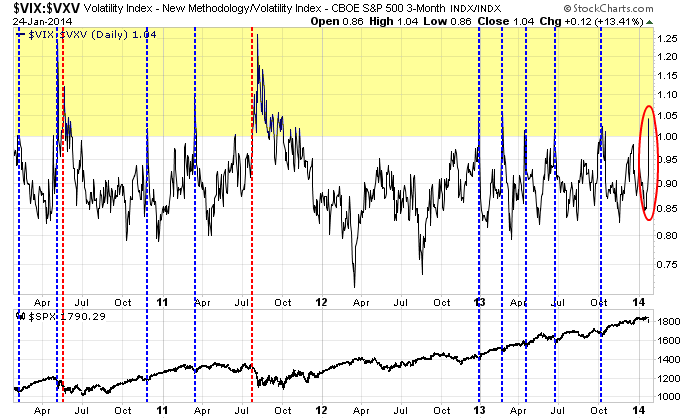 In the last three years, there have been ten occasions, excluding the current, where the term structure of VIX has inverted (yellow zone). Eight of those occasions have signaled a short term market bottom (blue vertical lines). Only two of the ten cases have marked further stock market declines (red vertical lines). The first, in 2010, prices did fall a little and then flattened out. The second and most notable decline occurred in the summer of 2011, which was plagued by the combination of a deadlock in Washington and the eurozone crisis - a vast difference in macro tail-risk compared to today. That's a 80% batting average for the bulls. Does any bear out there wants to bet against those odds? 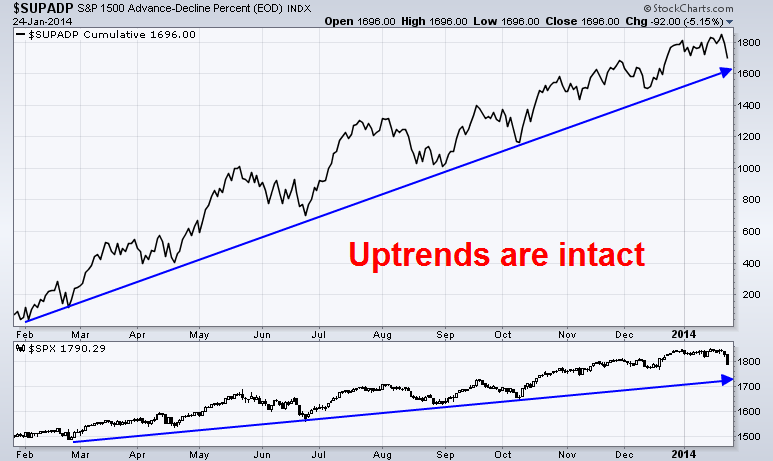 In addition, an analysis of the SP1500 advance-decline line shows this breadth indicator's uptrend is still intact and supportive of further advances in stock prices. To be sure, some technical damage has been done. The SPX fell below its 50-day moving average on Friday. In addition, the violation of the relative uptrend of junk bonds against US Treasuries indicating an interruption of the risk-on trade. While such readings are cause for concern, these could be minor violations and need to be confirmed by further weakness. In conclusion, I believe that the suddenness and violence of the two-day stock market downturn are suggestive that prices are likely to bounce next week - at least until Wednesday when the FOMC announces its decision. I will be watching two things. 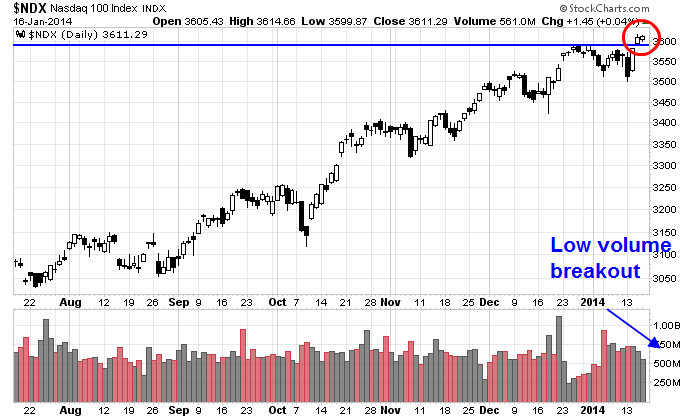 First, can the bears follow through with further weakness? As well, how will sentiment measures developing? The persistence of bullish sentiment will be contrarian bearish, while an upsurge in bearishness would be supportive of further stock market strength. Addendum: Please see Bill Luby's excellent post at VIX and More about the short-term profitability of fading VIX spikes here. The challenge for the Fed is to exit its bond-buying program without choking off the recovery. Its first attempt to reduce its bond purchase program in 2013 didn't go well: the markets were so spooked even by talk of "tapering" that market interest rates rose sharply, which fed through to mortgage rates, raising fears of renewed weakness in the housing market. The Fed's second attempt has proved more successful: it sugared the taper pill by simultaneously committing not to raise interest rates until unemployment had fallen below the 6.5% threshold that it had previously set itself. Thus was a monetary tightening transformed into a monetary loosening: Although the US economy is expected to grow by 3% this year, the Fed has persuaded the market that the first rate hike won't come until 2015. What could go wrong? One risk is that the Fed withdraws this stimulus too slowly. Even though inflation pressures currently appear low and the recovery seems fragile, asset prices are soaring, raising the specter of new bubbles that could jeopardize financial stability. U.S. stocks are trading at all-time highs, with the SP 500 up 29.6% in 2013, it's highest annual gain in 16 years. U.S. house prices rose 11.2% nationally in the year to the end of September 2013 with Las Vegas and San Francisco up 29.1% and 25.7% respectively, according to the S&P/Case-Shiller index. The Bank of England faces a similar challenge: it is trying to mimic the Fed's approach by using a 7% unemployment threshold to guide the market's expectations of when it will start to raise rates. But U.K. house prices are now rising by 8% a year, raising concerns the market may soon start over-heating. That means the BOE's strategy of keeping rates low until 2015 may depend on its ability to deploy so-called macroprudential tools to restrict the supply of mortgage credit. But if the Fed is forced to accelerate its monetary tightening, some fear it could lead to a repeat of last year's market stress. Indeed, the potential for market volatility may have increased as a result of new bank capital rules which have made banks more reluctant to provide liquidity. financial markets are not working normally may well have significant effects. Indeed, there is substantial empirical evidence that they do. Such effects may reflect limits to arbitrage in stressed conditions. Vayanos and Vila (2009) focus on such limits. And there are alternative channels through which asset purchases may work. Durre and Pill (2012), for example, argue that the main way in which the central bank using its balance sheet has affected the wider economy is through providing alternatives to intermediation owing through markets that have been disrupted. financial markets are operating more normally. The results that we report suggest that if the unwinding of large-scale purchases happens when market conditions are more normal they may have relatively little impact on asset prices and the real economy. scale policy can have in overcoming market incompleteness and ask whether unconventional monetary policy asset purchases by the central bank can be useful in such a world and where the zero lower bound on the policy rate may be binding. Regardless, the results of the model are highly intriguing. The debate isn't just academic and history will be the final judge. What are the bearish triggers? These days, my feelings about the US equity market are much like those of Jeff Gundlach and Jim Stack. All system lights are green. Valuations are elevated but not at bubble levels (see Gavyn Davies' How to detect a market bubble for a good discussion on this topic). While I believe that stock prices can make further highs in the next few months, I remain more cautious later in the year (see My plan for 2014). What’s next for stocks now? There is tremendous optimism and great belief in the equity markets. I think the stock market today is very similar to where the gold and silver markets were in March to May of 2011. They just kept going up. I remember going to meetings where people were like «Ah … I think we should buy gold and silver». At that time Silver was at about $42 and it went to $50 but then dropped to $20. That’s how I think of the market today. What’s your advice for investors? I’m not interested in buying equity markets now, particularly not the ones who have done the best like the US. I feel like putting new money to work in equities today is like buying silver at $42 in the spring of 2011. It may go higher. But just like silver at $42: You’re seeing a great amount of capitulation. It does feel like an echo of the late nineties in terms of market behavior. People are saying: «I can’t see any justification for the market not going higher, everything points to the market going higher». Well, I remember a similar mood in early 2000. At that time, an equity manager working for me said: «This is a stock market Nirvana. I have never seen better conditions for the stock market». So I said: «That probably means that things can’t get any better». It reminds me of a triple-A rated bond: There’s only one way for it to go: get downgraded. Stack isn’t reducing his recommended stock exposure, but he is watching the economy and some technical indicators like the advance/decline line (which tracks changes in the number of stocks with price gains vs. the number with declining prices) and his own proprietary index of bellwether (market-leading) stocks. “It’s not the kind of divergence we’ve seen in 2000 and 2007,” he told me, but it’s divergence nonetheless. So, what does his gut tell him? “My gut tells me we’re in the latter innings of this ball game,” he said in our interview. And he had a clear warning for investors who’ve been out of the market until now and are thinking of jumping into stocks again. I've therefore been thinking, what are the bearish triggers? An ugly, claw your eyes out bear market where stock prices are down 30% or more is unlikely to occur without a recession - and there is no sign of that on the horizon. However, a slowdown or growth scare isn't out of the question. Such a scare could result in a stock market setback of 10-20% this year. Let me first say that 20% downturns are part of equity investing and long-term equity investors should be prepared to stomach this kind of market action. If you can't stomach that kind of volatility, then you shouldn't be in the stock market. What are the bearish triggers for a 10-20% correction? I present below three scenarios, starting from the most likely. Housing weakness spooks the market? Two significant arguments contra my contention that housing demand will actually decrease at least for awhile YoY this year are that (1) there is a lot of pent-up demand, and (2) interest rates at 3% are still low so there shouldn't be that much of a reaction. Fair points. But this isn't the first time that there has been pent-up demand for housing in an era of low interest rates. 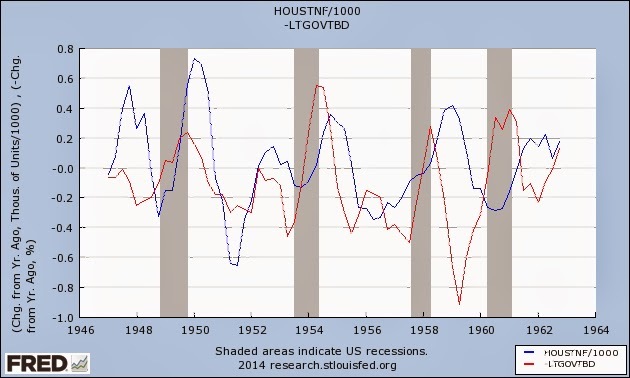 While the statistical series aren't identical, they clearly show that there was a huge housing bust during the Great Depression, that lasted through World War 2. Then all the GI's came home in 1945 and got busy making babies. Boom! I won't go through all his charts, but he went on to show the inverse correlation between housing starts responded to long-term interest rates in the 1940's and 1950's, a period characterized by pent-up demand for housing. Indeed, Bespoke has shown that homebuilder sentiment started to slip in January, though readings are not levels where investors are inclined to panic. 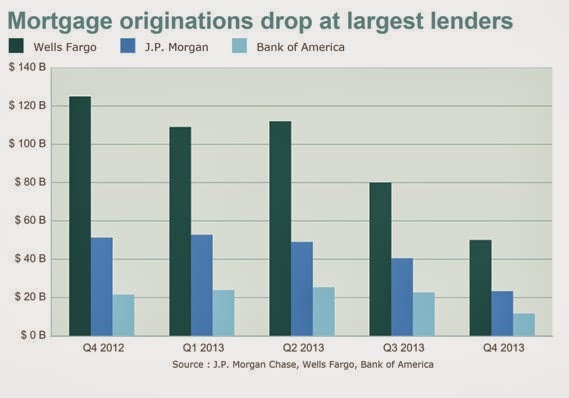 As well, Marketwatch pointed out that the latest earnings reports from the largest mortgage lenders show that mortgage origination is dropping. 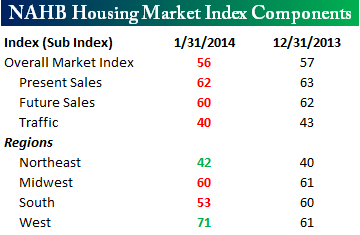 I am carefully watching the relative performance of the homebuilding stocks to the market. As the chart below shows, this group is undergoing a period of relative consolidation after making an intermediate term relative top. However, there is an eerie mirror image similarity to the price action in 2012. Then, homebuilders consolidated sideways on a relative basis before continuing their relative uptrend. Will they consolidate sideways and continue their relative downtrend in 2014? Or will they recover? A second scenario that could derail the bulls' train is the perception of rising inflation, which could prompt the Fed to prematurely tighten monetary policy. While the Fed may not actually raise rates, even the threat of rising rates could throw the stock market into a tizzy (also see my recent post The risk of catastrophic success). However, the threat of asset inflation is starting to rise. This chart of the relative performance of Metal and Mining stocks to the market shows that this group rallied out of a long-term relative downtrend and appears to be undergoing a period of sideways consolidation. If the relative performance of these stocks tick up, then watch for Mr. Market to get nervous about rising inflation and Fed tightening. As well, I am also watching the price of Sotheby's as a proxy for the price of hard assets like collectibles. Will it break out of the current trading range to the upside or the downside? No discussion of asset inflationary pressures would be complete without highlighting Warren Buffett's recent high profile purchases into the asset inflation sensitive energy sector, namely Suncor, ExxonMobil and Philips 66. What does he know that the rest of us don't know? For now, the threat of asset inflation remains tame. Nevertheless, I can imagine a scenario where the combination of a weakening housing sector and rising inflationary expectations/Fed tightening lead to fears of stagflation and substantial stock market losses. As well, there is the ever present risk of a financial implosion in China. I have written extensively about these risks and I won't repeat them here (for a summary see this). Industrial and Commercial Bank of China, the world's largest bank by assets, said on Thursday that it has no plans to use its own money to repay investors in a troubled off-balance-sheet investment product that it helped to market. “Regarding this unsubstantiated rumour, a situation completely does not exist in which ICBC will assume the main responsibility (for the trust product),” an ICBC spokesman told Reuters by phone on Tuesday. The trust product, called "2010 China Credit / Credit Equals Gold #1 Collective Trust Product", used the funds it raised from wealthy investors in 2010 to make a loan to unlisted coal company Shanxi Zhenfu Energy Group Ltd. But in May 2012, Zhenfu Energy's vice chairman, Wang Ping Yan, was arrested for accepting deposits without a banking licence. Following an investigation, China Credit Trust told investors that Zhenfu Energy had taken out high-interest underground loans totaling 2.9 billion yuan, bringing its total liabilities to 5.9 billion yuan and threatening its ability to repay the trust loan. China's coal industry has been battered by falling prices over the last year. Several other banks and trust companies are facing losses on loans to another coal company, Liansheng Resources Group. Analysts have expressed increasing concern in recent years about Chinese banks' exposure to off-balance-sheet risks. While trust products and other so-called wealth management products typically don't carry a formal guarantee from banks that help to create and sell them, bankers worry that investors widely perceive them as carrying an implicit guarantee from state-owned banks. Rising local government debt has had many concerned about an impending financial crisis in China. The latest audit of Chinese government debt, showed that local government debt is up to 17.9 trillion renminbi (about $2.8 trillion). And shadow banking, including the use of wealth management products (WMPs) — a pool of securities like trust products, bonds, stock funds that offer higher yields than bank deposits and are sold as low-risk investments — has been one of the main sources of credit for local governments. We've seen WMPs rise 47.4% in Q3 2013, from a year ago. Trust products are up 60.3% in the same period and LGFV bonds are up 59.7% on the year. In the past five weeks, we've seen sales and yields of WMPs spike. Eighty-three percent of WMPs sold in the last five weeks have seen an expected return of 5-8%, an all-time high, Cui points out. The mainland's fiscal position is weaker than official data shows but not significant enough to cause alarm, the IMF said in a report released yesterday. The International Monetary Fund also warned that the mainland was now "more vulnerable to a macroeconomic shock" because of its higher debt and bigger deficit. It estimated that the mainland's augmented fiscal debt, which mainly refers to borrowing by local governments, rose to about 45 per cent of its 51.9 trillion yuan (HK$66.6 trillion) gross domestic product in 2012. "The rise in augmented fiscal debt, however, is indicative of underlying challenges in local government finances," the report said. What happens when some of these local government financed WMPs default and the (government-owned) bank that marketed them won't stand behind them? Could it shake the confidence of Chinese investors? If so, what are the possible global contagion effects given the size and role of the China in the world's economy? Will the "2010 China Credit / Credit Equals Gold #1 Collective Trust Product" mark the beginning a Countrywide-like death spiral, which kicked off the Subprime Crisis and subsequent Lehman Crisis, or a Dubai default of 2009, which the market shrugged off? For now, credit markets remain relaxed about any potential crisis in WMPs. The relative performance of Dim Sum bonds to US Treasuries remain in a relative uptrend, indicating no signs of stress in the system. Needless to say, if the Chinese financial system were to implode and the contagion effects spread into the global financial system, the downside risk in US stock prices will not be limited to 20%. Our profit model is signaling continued positive growth ahead, consistent with persistent dividend hikes, and rising government tax receipts. Reduced fiscal drag and policy uncertainty in 2014 will remove a major barrier to business confidence, and thus investment. [M]acro conditions will remain supportive of the overshoot in equity prices for a while longer, but only until Treasury yields become restrictive. In this environment, it makes sense to focus on profit performance rather than expectations for further valuation expansion. Deep cyclical sectors provide protection against rising bond yields and are well positioned to deliver better-than-anticipated profitability. My inner investor is nervously staying long, but watching for the bearish tripwires to be triggered. Is France finally getting its act together? There is a French elephant in the eurozone room that no one dares to speak about. While Brussels can manage crisis after crisis in peripheral countries, a blowup in France is too big to contain as the French-German relationship lies at the political heart of the European Union. Since I wrote those words, the CAC 40 has been range-bound against the Euro STOXX 50 for the last four years. French President François Hollande said on Tuesday he would cut public spending by 50 billion euros ($68 billion) in 2015-17 and ease the tax burden on companies by phasing out hefty family welfare payroll charges. The embattled French leader stunned the left-wing of his own Socialist Party by calling for a new economic strategy based on “supply-side” policies, accompanied by €30bn of fresh spending cuts by 2017 to pave the way for lower taxes and charges on companies. The shift has been widely compared with Tony Blair's New Labour policies and the reform drive by German Chancellor Gerhard Schröder in 2004, though Mr Hollande vehemently denied any infection from market “liberalism” in a televised press conference. But then the announcements of this year's new political paths are over, and the cold shower everyone had been expecting arrives. As soon as the floor is opened to journalists' questions, the first one comes: Will Valérie Trierweiler be accompanying the president on his trip to Washington at the start of February? This is what is currently preoccupying France. Hollande's partner has been in the hospital for several days with "exhaustion," after a Paris gossip magazine reported an alleged affair between the president and an actress. "I understand you asking the question, and I am sure you will understand when I answer that everyone goes through trials in their private life. It hurts. But I have a principle: private business is dealt with privately." It sounds like that Hollande's government is getting serious about the discipline imposed by the markets and these announcements are not intended to distract the public from the stories about his private life. A Pew Research Center poll (via Business Insider) shows that the French public are far more relaxed than the rest of the world about the acceptability of extramarital affairs. As an aside, no doubt there are some American politicians (named Clinton, Gingrich and even Palin) wished that they were French after seeing the results of this poll. Regardless, if Hollande were to be serious about these reforms, France may not have far to go in order to become an engine of growth for the eurozone. Already, a BBC report highlighted the fact that French productivity is in fact better than Britain's. What can Europe do if French business were to undergo a Renaissance? France's labour productivity stands at a healthy €45.4 (£38) per hour worked according to Eurostat, well ahead of the EU average of €32.1, while the OECD reports that the average number of hours per week worked in France stood at 38 hours for 2011, compared to 36.4 in the UK and 35.5 in Germany. Productivity per hour in France is 15% higher than in the UK. Hard work indeed! Bottom line: The news of this important political development must be regarded as another reason to be bullish on Europe (see my recent post A one-way bet on eurozone equities). After the SPX tested all-time highs on Wednesday, it was not surprising to see the major US stock market averages pull back on Thursday. The decline was surprisingly light. What I found supportive of the bull case was the upside breakouts shown by the high-beta leadership such as the NASDAQ and small caps. Consider, for example, the chart below of the NASDAQ 100. Not only did the upside breakout hold, the index went on to further new highs on Thursday. However, these upside breakouts were staged on falling volume, which suggests that a near-term pullback may be necessary before stock prices move to sustainable new highs. This chart of the Russell 2000 small cap ETF (IWM) shows a similar pattern of further breakouts on Thursday, but on low volume. On an intermediate term basis, cyclical stocks remain in a relative uptrend compared to the broad market, indicating that Mr. Market still believes that economic growth is undergoing a period of acceleration. This week is option expiry week, which tends to have an upward bias. The week after option expiry has tended to have a negative bias for the market. The current market action is highly suggestive of a minor pullback next week. 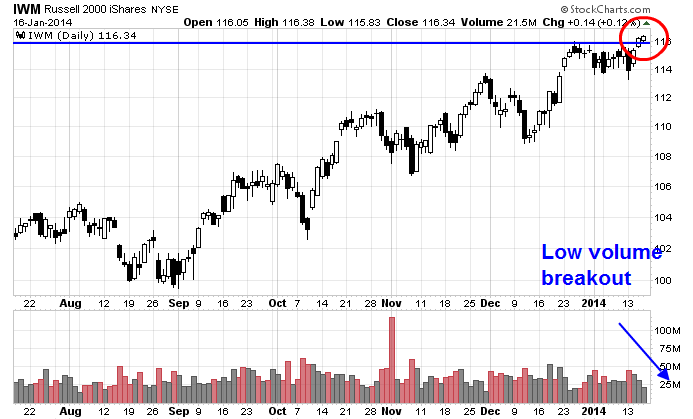 Even though my base case calls for further highs in stock prices, I am cognizant of a bear case for equities. If the forecast weakness were to occur next week, I would closely watch sentiment model readings for direction. Hays Advisory correctly pointed out that sentiment models showing a crowded long reading. If bullishness were to pull back with prices, then I would see that as a green light to go long. On the other hand, if the level of bullishness were to stay stubbornly high, then it would be a warning that an intermediate term market top may be in place. Industrial production across the euro zone jumped by a faster-than-expected 1.8 percent on the month, the biggest increase since May 2010 and rebounding after an upwardly revised 0.8 percent drop in October, the EU's statistics office Eurostat said on Tuesday. "Today's industrial production figures make for encouraging reading and will fuel hopes of a sustained recovery in 2014," said ING bank economist Martin van Vliet. European Central Bank President Mario Draghi said that deflation in some Eurozone member states is the result of a necessary adjustment process but added that he does not see a risk of broad-based deflation across the currency area. In a letter to European parliamentarian Auke Zijlstra published on the ECB's website Monday, Draghi also said he expected annual inflation to remain near its current level over the next few months. Annual EMU inflation stood at 0.8% in December, according to Eurostat. Draghi reiterated that the ECB stands by its forward guidance and is "ready to use all available instruments to fulfil our mandate." From a technical viewpoint, the outlook for eurozone equities is constructive. The chart below shows the relative ratio of the ETF for the Euro STOXX 50 (FEZ) against the ETF for the MSCI All-Country World Index (ACWI). All prices are in USD as to neutralize the currency effect. This technical pattern looks very much like a bullish cup and handle formation. Should FEZ stage a relative breakout against ACWI, it could be a signal for further significant gains for eurozone equities. For now, eurozone equities appear to be a one-way bet. Is Beijing losing its nerve? Stephen Roach had long been a booster for China and her growth. His recent Project Syndicate article complaining about China's strategic incoherence was therefore a little surprising. In the article, Roach acknowledged that the long term goal of reform and changing the nature of economic growth from a quantity to quality focus involves tradeoffs. One of the negative consequences is a slowdown (also see my previous post Where's the short-term pain in China?). However, Chinese policy makers remain intensely focused on near-term economy wide growth targets, seemingly unwilling or unable to implement the long-term goal of rebalancing growth. Is this a sign that Beijing is losing its nerve for restructuring? Premier Li Keqiang is cracking down on less-regulated shadow banking activities, estimated by JPMorgan Chase Co. at $6 trillion in May last year, while the central bank engineered a cash crunch in June 2013 to push deleveraging in the world’s second-largest economy. China’s borrowing spree since 2008 has evoked comparisons to debt surges that tipped Asian nations into crisis in the late 1990s and preceded Japan’s lost decades. Similarly, the relative performance of the Dim Sum bond (Yuan denominated bonds issued in HK) ETF compared to US Treasuries remain in a relative uptrend, indicating little signs of financial stress. So far, so good? Well, sort of. In a Jan. 2 op-ed for Project Syndicate, Soros didn't say whether he's shorting China. But he did connect the dots in a way that can't make President Xi Jinping happy. To Soros, the main risk facing the world isn't the euro, the U.S. Congress or a Japanese asset bubble, but a Chinese debt disaster that's unfolding in plain sight. “There is an unresolved self-contradiction in China’s current policies: restarting the furnaces also reignites exponential debt growth, which cannot be sustained for much longer than a couple of years," Soros wrote. Aware of the dangers, the People’s Bank of China took steps starting in 2012 to curb the growth of debt; but when the slowdown started to cause real distress in the economy, the Party asserted its supremacy. In July 2013, the leadership ordered the steel industry to restart the furnaces and the PBOC to ease credit. The economy turned around on a dime. In November, the Third Plenum of the 18th Central Committee announced far-reaching reforms. These developments are largely responsible for the recent improvement in the global outlook. Soros and Roach are right. How Beijing rids itself of the addiction to credit-fueled infrastructure growth will determine the long term growth path of China. The authorities can choose to take a little pain now or a lot of pain later. 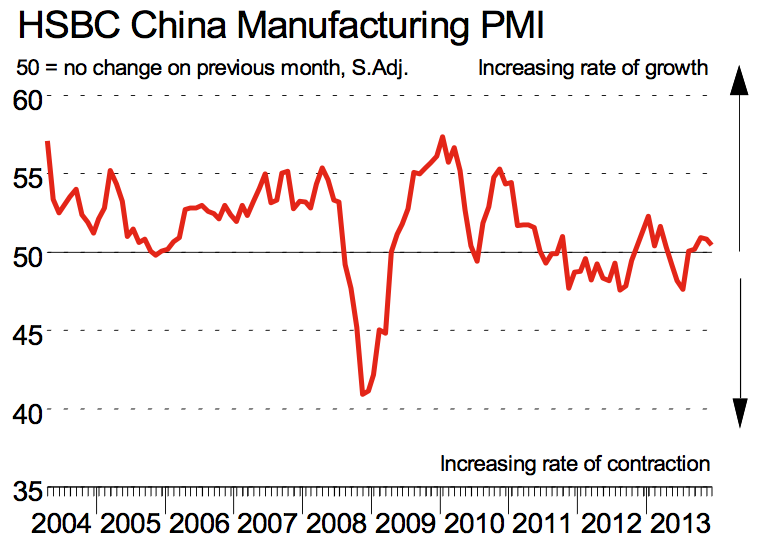 I am watching this chart of the HSBC China Manufacturing PMI closely. As the pace of growth decelerates and the line gets closer to 50, which indicates a slowdown, will Beijing lose its nerve and "restart the furnaces" and choose the path of a lot more pain later? Will the ECB push eurozone small caps higher? The good news in Europe is that the freefall in the periphery has been arrested and an anemic recovery has begun. 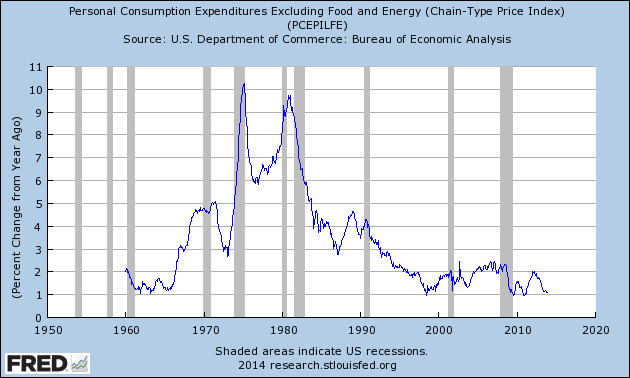 The bad news is that the risk of deflation still hangs in the air. The big fear in Europe used to be that the economy would collapse. Now the big fear is that Europe is going to become Japan, an economic bloc mired in deflation and horrible growth. What can the ECB do? European Central Bank President Mario Draghi said Monday [December 16, 2013] that any future long-term financing operation will be tailored to ensure the money reaches the real economy but warned it was a complicated scheme that the ECB must consider carefully. On the possibility of a conditional long-term refinancing operation (LTRO), Draghi said the ECB's original LTROs already included elements of the Bank of England's Funding for Lending scheme and noted there were "operational complications" involved in implementing such programs among 17 countries, rather than one country. Draghi said that if the ECB were to engage in another LTRO, it would be "making sure that this money reaches the real economy and doesn't stop in the banks, or [result in] the banks buying bonds only." These concerns about SME lending are not new to the ECB. On Thursday, I would watch the ECB statement and Draghi's language as to how they might move on a conditional LTRO program. While no action is likely this week, we may get greater clarity on this issue as any central bank stimulus targeted at the real economy would be tremendously bullish for eurozone small cap stocks (see my previous post More reasons to buy Europe). Already, the European small cap ETF (DFE) has been in a relative uptrend against its large cap counterpart (FEZ) which began in late 2012. Any hints of further ECB action in support of SME lending would likely spur further outperformance in European small cap stocks. Cullen Roche at Pragmatic Capitalism recently highlighted the results of the latest AAII asset allocation survey, which indicated that individual investor equity allocations are at post-Crisis highs - a crowded long reading. 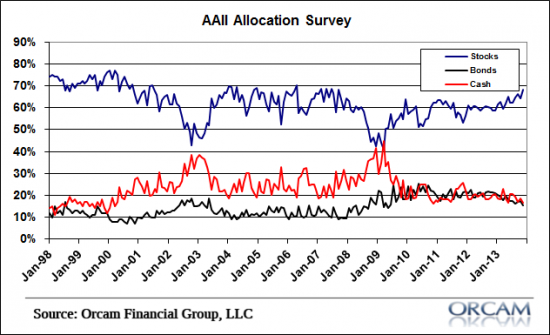 As an aside, I find the AAII asset allocation survey to be more useful than the sentiment survey, because this is a case of watching what they do (asset allocation), not just what they say (sentiment). 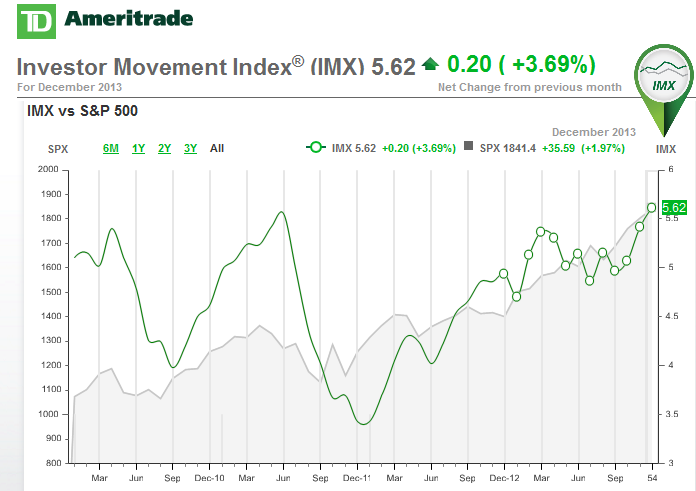 TD Ameritrade also publishes a monthly survey of their customers' equity allocations, called the IMX Index (shown in green in the chart below). The IMX Index does not have as much history as the AAII surveys, but it does confirm the observation that individual investors are now plunging into the stock market. With retail investors at a crowded long, is it time to get more cautious on US equities? Not yet. Institutions haven't finished buying. 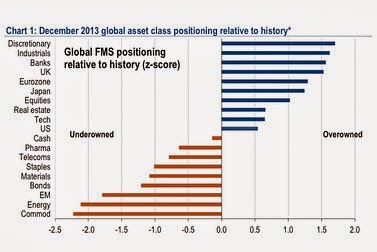 The chart below shows the aggregate asset allocation by fund managers. Managers are significantly overweight European and Japanese equities and overweight US equities, though not at excessive levels. The US equity overweight is barely 0.5 standard deviations above its historical mean, which is just noise. 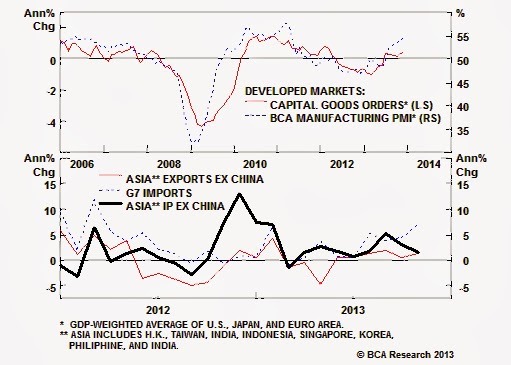 In addition, the Street's consensus is turning towards better economic momentum in 2014 and the chart below from BCA Research is one of many examples. The improvement in the global macro outlook is a major reason why fund managers are taking on greater equity risk. With positive economic momentum and improving fundamentals pushing institutional portfolios into a higher equity allocation, US stock prices appear to have further room to run in the next few months. By mid-year, institutional buying will likely have pushed stock prices higher and moved fund managers closer to a crowded long position. Should those events transpire, my base scenario of a strong first half of 2014 and a weaker second half for the stock market (see My plan for 2014) is starting to look pretty good.